The shy Nadeko Sengoku is slowly being strangled to death by snakes. She is the victim of a curse, cast by a heartbroken boy and his jealous female companion. Koyomi Araragi wants to help her, but can he find a cure? Or will he be forced to resort to extreme violence? 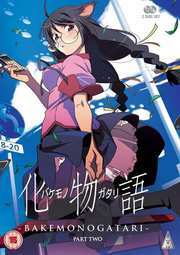 Moreover Tsubasa Hanekawa, the busybody class representative, is morphing into a cat. She is cursed with intense stress, perhaps even abuse. Koyomi maybe able to help, but it also may cost him his life. In the climax to this award-winning series, Koyomi Araragi threads the needle of right and wrong to within an inch of his life, all in the name of love.